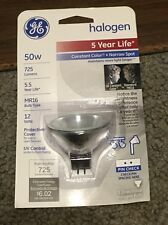 10 x GU10 50W Halogen Light Bulbs Spot Lamps - Great Quality - SALE !! Joblot 10 X Status 50W Dimmable Halogen GU10 Bulbs . Condition is New. You will receive 10 bulbs Larger joblots available FREE POSTAGE !!!! GU10 Halogen Bulbs. GU10 Energy Savers. Light up your spaces with these 50w light bulbs from STATUS, the market leaders in lighting and electrical excellence. 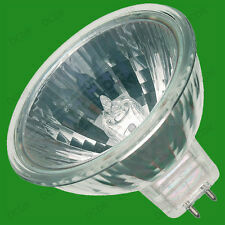 50 Watt Bulb Clear Glass 240v GU10 Average life 2000 hours. 10 X STATUS GU10 50W HALOGEN BULBS. FACE SIZE 50MM X DEPTH 55MM. Cap: GY6.35. We will always help you to have a 100% positive happy buying experience. BUY 1, GET 1 FREE! Add to Favourites. Need it fast?. 2,000 Hour Life. 10 x 25W/40W/50W/60W G9 LED Halogen Bulbs Warm White Glass Bulb Lights 220V. ●Easy to install, can be easily fitted G9 sockets. Base Type G9. Working Power 50W. Light Color Warm White. ◇When the lamp bulb is lit, the temperature is high. 10 X 100W LINEAR TUNGSTEN HALOGEN LAMP FOOR FLOODLIGHT 240V. Fire Alarm Cable. Junction Boxes. Reflector Bulbs. Battery Cable. Cable Accessories. Cable Cleats. Fluorescent Tubes. Climate friendly – convert energy to light, not heat Incredibly long life span (more than 20,000 hours). LIGHT COLOUR: WARM WHITE - 2800k. Huge variety of white tones and colors Very bright, clean light quality. Dimmable (HLX). Instant light (HLX). 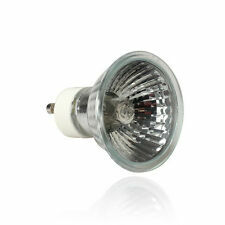 These bulbs are fitted in a large number of lighting effects, and give excellent life and brightness. G6.35 lamp base. Lamp Leads & Accessories. All goods have a 1 year warranty manufacturers warranty (unless otherwise stated) with the exception of goods which are classed as “Consumables”. MR16 Halogen Bulbs. 50watt 12volt Square Mr16 Average Rated Life 2000hrs 60 Degree Beam Angle Square Shaped Mr16 Cool Beam Halogen. 50watt 12volt Square Mr16. Square Shaped Mr16. Halogen Bulbs. G4 Halogen Bulbs. Spot Lights - GU10's. Tungsten Halogen Floodlights. PAR 38 (Flood / Spot). Height : 50 mm. 100% QUALITY. We pride ourselves on providing high quality products at the lowest possible prices in the UK. 8 X GU10 240V VOLT 50W WATT HALOGEN LAMP BULB. ALUMINIUM COATED REFLECTOR. GU10 Halogen Bulbs. GU10 Energy Savers. GU10s give instant light and are fully dimmable. 50watt 240volt GU10 Halogen Spot Lamp. Halogen Bulbs. G4 Halogen Bulbs. G6 Halogen Bulbs. G9 Halogen Bulbs. Beam angle. OUTDOOR GARDEN LIGHTING. BATHROOM LIGHTING. Average life. MR16 12-Volt GU5.3. Fits a standard MR16 two pin fitting. 25 degree beam angle. Life 2,000 hours. 5Pcs 24V G5.3 35W/50W Base Halogen Bulbs Light Lamp Bulb new.